Written by CAMERA intern Aron White and originally published at the blog of CAMERA on Campus. 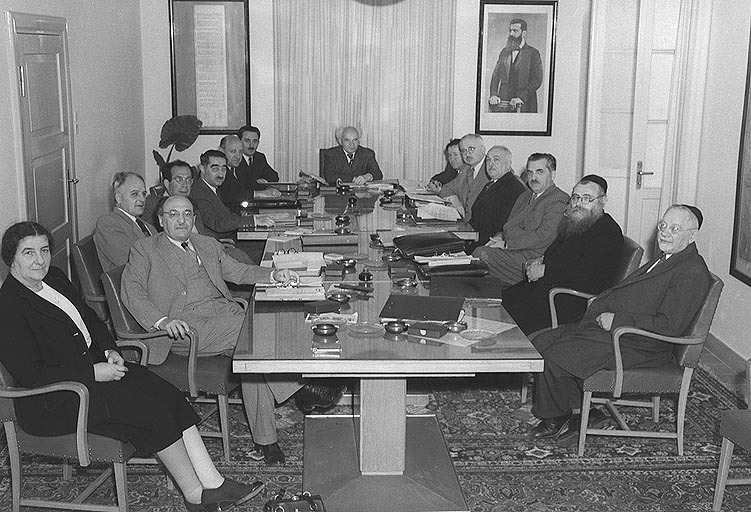 February 14th is Valentine’s Day, but for Israel it is a special anniversary, as the Knesset marks its 68th birthday. 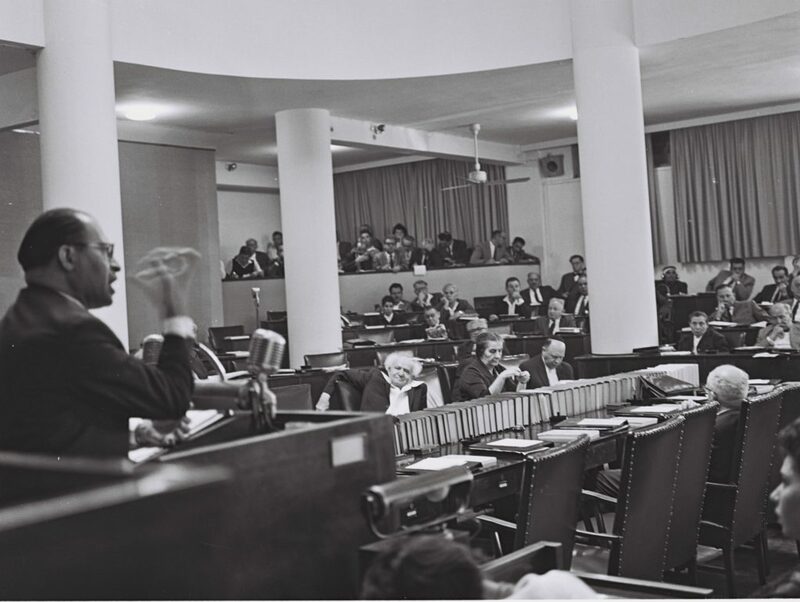 On February 14th 1949, the First Israeli Knesset convened, lead by the elected Prime Minister, David Ben Gurion, marking a pivotal event in one of the most exceptional and underappreciated elements of Israel’s story – the story of Israeli democracy. One unique feature of Israeli democracy is that it seems to have come out of nowhere. Israel did not inherit a democratic system – at the turn of the 20th century, when the Zionist dream was beginning to take shape, the land that would become the state of Israel was ruled by the Ottomans, who ruled through an autocratic monarch. The first Zionist leaders, such as Ben Gurion and Weizmann, themselves grew up in the Russian Empire; a Tsarist, not a democratic, regime. And in the first three years of Israel’s existence, its population doubled (itself a unique feat) due to immigration – and the majority of these immigrants came from Eastern Europe and the Arab nations in the Middle East, thus once again, not bringing with them any experience of living under democratic rule. The location, founders and citizens of Israel had no experience of democracy – so where did Israeli democracy come from? One of the most convincing answers is that the roots of Israeli democracy lie in the history of Jewish communities through the Diaspora. In much of the Jewish Diaspora, Jews had some degree of autonomy, and elected officials to lead their communities; this idea goes all the way back to the Talmud, which states “We do not appoint a leader over the community, without first consulting with the community” (Tractate Brachot 55a). The Bible, whilst supporting a monarchical system, places limits on the use of his power, as well dividing power between the priests, the king and the prophets. The long experience of Jewish suffering in the Diaspora at the hands of tyrannical leaders ,may also have led the early Zionists to embrace democracy as the best form of government. Whether this is the explanation, or there is some other reason, Israeli democracy was by no means a foregone conclusion given the circumstances of Israel’s founding. We also now take for granted that Israel managed to maintain a consensus about the legitimacy of the Knesset, and that everyone would agree to play by the rules of democracy – but given the circumstances, once again this was not a foregone conclusion. In the 20th century, many states achieved independence, and in many of them, tensions between different groups or ideologies led some to challenge the legitimacy of the rules, sometimes leading to separatist movements, insurgencies or even civil war. On the day of its founding, Israel also had major ideological rifts between its leaders. In the struggle for the foundation of Israel, Israel had two defense organizations; the mainstream Haganah defense organization, which by 1948 was led by David Ben Gurion, and the Irgun defense organization, led in 1948 by Menachem Begin. These two paramilitary groups had both defended Jewish villages from Arab attack, but had different ideological outlooks, the Haganah being broadly in the Labor Zionist camp, and the Irgun being in the Revisionist Zionist camp. They held different opinions on how to achieve independence, and how to respond to Arab attacks on the nascent Yishuv, amongst other issues. When the State of Israel was declared, David Ben Gurion announced that his organization, the Haganah, would become the Israel Defense Forces, and that the Irgun, Menachem Begin’s group, must be disbanded as an independent group, and come under Ben Gurion’s control. In fact, when Ben Gurion was informed that a shipment of weapons was arriving for the Irgun in June 1948, with Menachem Begin aboard, Ben Gurion ordered that the IDF capture the ship, (the Altalena) to ensure that the Irgun does not continue to function as an independent military. The IDF followed his orders, and when the Irgun ship reached Tel Aviv, began firing mortars at it. Stop the picture there – two military groups exist in a newly independent country, with the IDF demanding the Irgun accept its authority, and they have fired mortars at an Irgun ship, with its leader on board. Any student of 20th century history would tell you that such fighting, between two groups at the beginning of statehood, spells the beginning of an insurgency or a civil war; this is what happened in Angola in 1975, and is not dissimilar from what happened in Eritrea in 1972, to give some examples. Yet despite the fact that the IDF had fired mortars at him, Begin told his men to hold their fire. He accepted the sovereignty of Ben Gurion and the IDF, and disbanded the Irgun as an independent force. He continued to accept the sovereignty of Ben Gurion and the Knesset, and proceeded to sit in opposition for twenty-nine years, one of the longest periods any person has ever sat in opposition for – until he was elected Prime Minister in 1977. The leader of a paramilitary group had held his fire, and accepted the authority of the democratically elected ruler, sitting in opposition for three decades without ever turning to political violence – an exceptional phenomenon, and one that saved the nascent Israeli democracy. The democratic institutions of the State of Israel were accepted as legitimate, and became accepted by the vast majority of Israeli society – a rare achievement in a newly independent country. So Israel’s democratic start was unlikely, and consensus as to its political legitimacy was also not to be taken for granted. But the fact Israel has maintained its democracy over the past 68 years is also remarkable, given the range of challenges that the country has faced. The country has existed in a constant state of war; it has faced three wars of annihilation (plus six other wars), two intifadas, thousands of rockets, countless plane hijackings, suicide bombings and stabbings, and the constant threats of war and destruction from its neighbors. Internally, Israel has a twenty percent national minority, many of whom are hostile to the existence of Israel as a Jewish state, and some of whom have taken up arms against Israel. The Jewish population of Israel is itself is divided along countless social fault lines – Ashkenazi/Sephardi, religious/secular, right wing/left-wing, and by country of origin. Israel has always had coalition governments, with no single party ever winning an absolute majority. And vigorous debate continues in Israel – Michael Oren points out that 5% of Israel’s population came out on the streets in the social protests of 2011, the equivalent of 15 million protestors in America. But despite all these challenges, Israel has remained democratic and united, without ever resorting to authoritarian rule. There are very few countries in the world that have remained democratic between 1948 and 2017 without interruption. In 2016, the Economist Intelligence Unit gave Israel a Democracy rating of 7.85, close to the rating of the USA (7.98), and France (7.92). On the Knesset’s 68th birthday, it is clear that Israeli democracy, remarkable as it is, is as strong as ever.